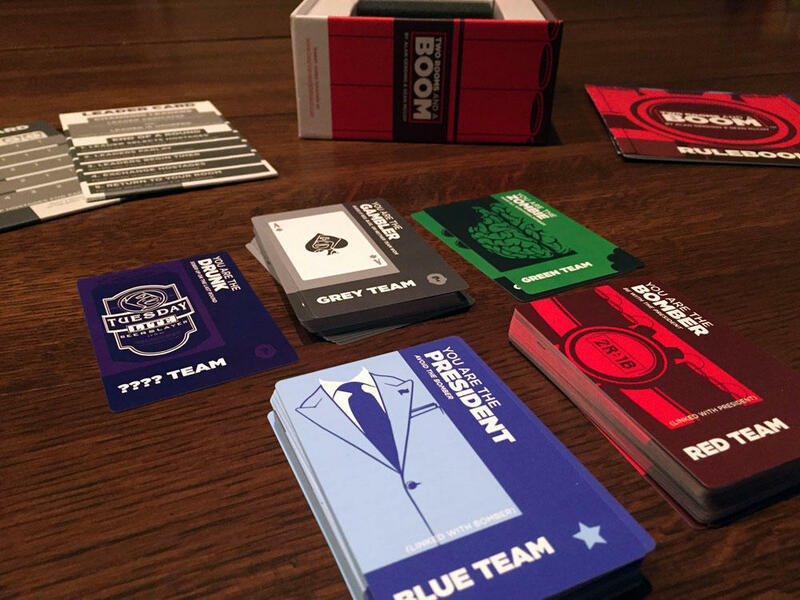 We review Two Rooms and a Boom, a social, card based party game for 6-30 players, where you break players in two teams spread between two rooms who try to blow the other team’s leader away. If you meet your team’s goal, you win! Who doesn’t love a good get-together or party? I look forward to seeing people that I normally don’t get to see often and catch-up. I’m a pretty social person and also like to meet new people and build relationships (or cross people off the potential friend list). Being a gamer it also gives you an ideal time to break out the occasional party game and see if you can convert some non-gamers. This is always somewhat tricky to me because there’s typically no grey area with party games. They usually make the party epic or bust it up in my opinion. So, given my boom or bust party game gauge, we look at the social, party game: Two Rooms and a Boom. This game breaks the party people in two teams spread between two rooms who try to blow the other team’s leader away. Does Two Rooms and a Boom make your party night epic or was it just another party game dud? Read on! Two Rooms and a Boom is a social party game for 6-30 players runs between 7-20 minutes per play. 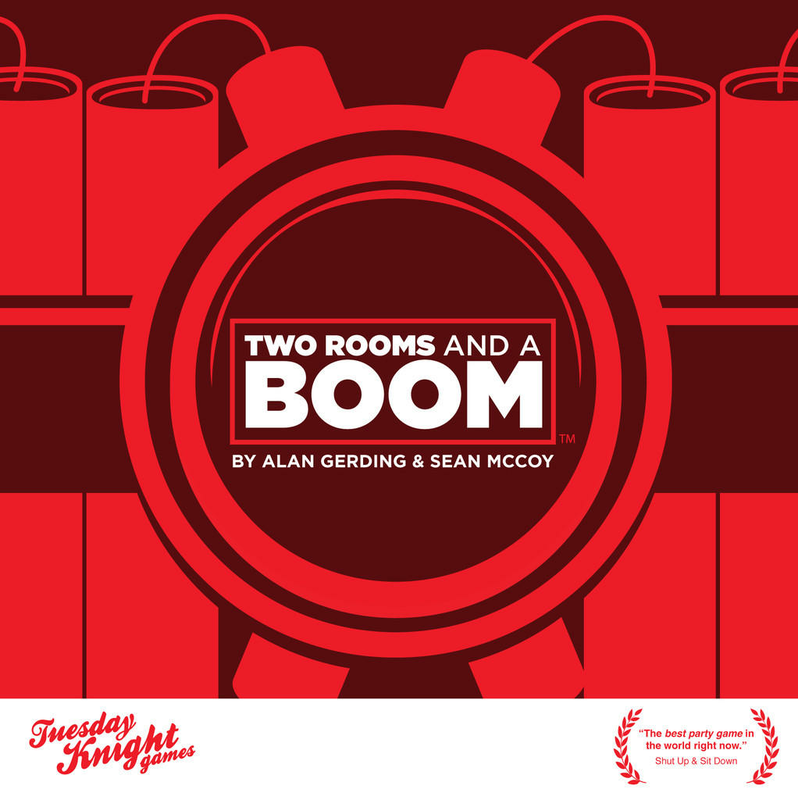 Two Rooms and a Boom plays best with 12+ players. The object of this game is fairly straight forward. There are two teams and there should be two rooms or playing areas. The two base teams are the Blue Team and the Red Team. There are representative Character Cards (equal number for the number of players) that are randomly dealt facedown. The Blue Team will always have the President and the Red Team will always have the Bomber. Over the three rounds of play, players in each room will reveal (or not) their Character Card. Also, at the end of each round some players will be traded between the two rooms. 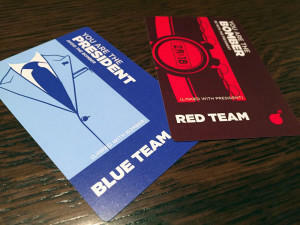 At the end of the third round there is a final reveal of all Character Cards, the Blue will win if the President is not in the same room as the Bomber and the Red team will win if the reverse is true. Sounds easy right? Read on and you will see why it’s not so easy. 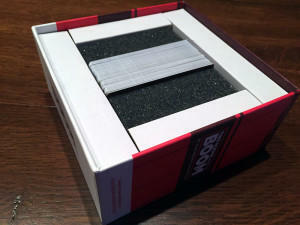 Two Rooms and a Boom has excellent production values and packaging for continued use. The game comes with a few different components, all of which are of great quality. The Rule Book is on the short side, but the designers still did an excellent job explaining the rules while clearing up most grey areas in the game play. The Character Guide is shorter as well, but dense with the rules for playing each Character Card. I say it’s dense, but there are 110 Character Cards to explain. 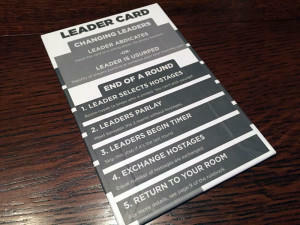 The Leader Card is a reference for each room leader and team alike and is a very thick card stock which makes is durable. Lastly is the Character Cards and as mentioned above and there’s a lot of them. Most players will interact mainly with the Character Cards and possibly the Character Guide for reference. I would recommend using card sleeves for the Character Cards because I don’t like people messing up my stuff. The cards are good quality and will hold up without sleeves but I just don’t trust my friends and/or family especially if adult beverages are involved. The other thing to note on the Character Cards is the artwork and iconography. The designers could have just simply put the words President or Bomber on a card and that would make the game usable in a Spartan sort of way. But they instead have text and recognizable images and iconography that denote a team. Overall the artwork gives an excellent visual to the game owner and player alike. The designers did a great and purposeful job to make the images on the cards stand out and used images that most players can easily relate to. This is an important step to note and you need to do the following four steps at the start of each game. Set Up The Character Deck: this is vitally important to be sure that you have even cards for each team and that whoever is teaching the game to the group explains what the different roles prior to starting. Separate Players into 2 Rooms: players should be randomly and divided between the rooms as evenly as possible. Deal Character Cards: each player receives one random facedown Character Card. Start the timer: It’s important to note that each of the three rounds is timed and that the first round is the longest (suggested 3 minutes) and the subsequent rounds will drop by a 1 minute. Every game will use the President and the Bomber. Be sure to find both for your team to win! As the round begins, you need to select a Leader for each room. Players have to nominate a player and not themselves. Things to remember before the end of the round: time is public (everyone knows how much time is left in any round), you must stay in your room, no direct communication between rooms, keep your Character Card (no trading), and as you reveal your Character Card to players in your room you must show the entire card. 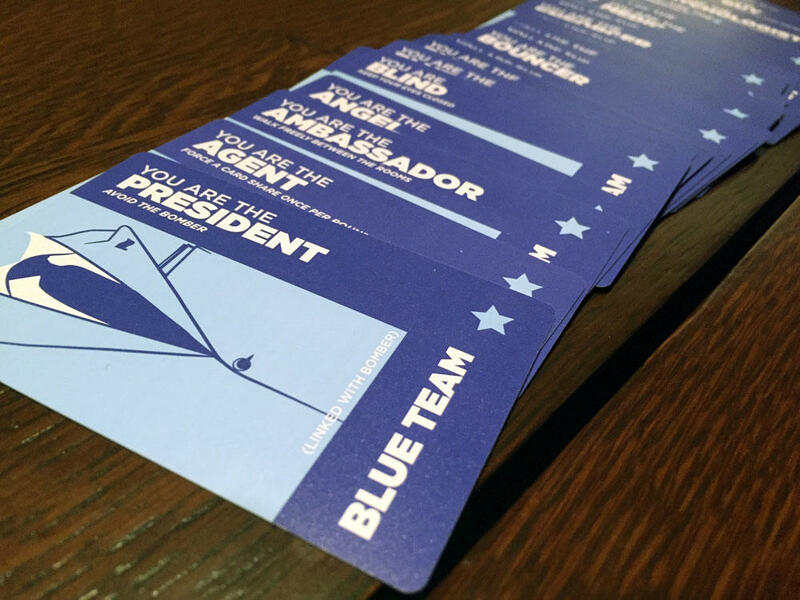 The goal is to find your team members, President, and Bomber so you need to be careful who you want to reveal your Character Card to (hence the social aspect of this game). Leader Selects Hostages: – depending on the number of players and round, anywhere from 1-3 players are selected to go to the other room (there has to be an equal number going between rooms). Leaders Parley – Leaders will meet without their hostages in case one is slow to select they won’t be influenced by seeing which hostages were already selected. Leaders Begin Timers – This starts the next round. Leaders return to their rooms – and if there’s a next round it begins. Now at any time a leader can step down or a room can usurp the leader and replace with another. When usurping, the room will vote for the new leader and the majority will win (you have got to love the democratic process). 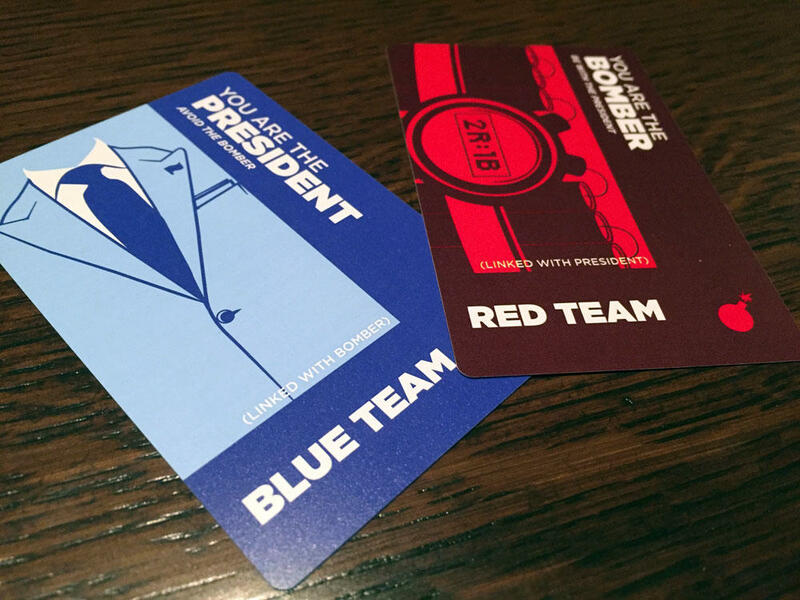 When the game ends, all players from both rooms reveal their cards and for the basic character rules and one team will win or lose if the Bomber and President are in the same room or not. The rules will get more complex and the win conditions will change as you add more advanced characters. There are 2 base teams: Red & Blue plus advanced team Character Cards for Grey, Green, & the Drunk. Let me say out of the gates that my overall experience of Two Rooms and a Boom was epic. I had the best experience at GenCon 2015 with a large group (30+ people). I think to simply call this a party game is an insult because the social aspects and interactions could be applied to any social situations outside of a party environment. This social game has little down time, moves very quickly, and is very versatile for any size group. I will say that my best game experiences were with larger groups and so I’m somewhat basis toward wanting to continue that trend with Two Rooms and a Boom. The shear amount of Character Cards makes the replay off of the charts and should give players a different experience as long as they get different cards to use. In all of my plays so far for Two Rooms and a Boom we never used any of the advanced Green team cards and only a few Grey Team Cards (mainly the Gambler). These also give more versatility and replay as well. 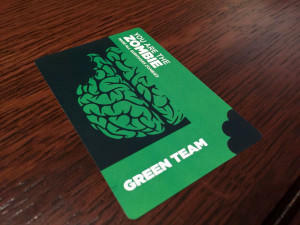 The next time I play Two Rooms and a Boom we WILL be using Green team and ideally different advanced cards because I’m dying to see what these will add to the game. I haven’t yet used Green team members but I’m dying to see how they impact player interaction. I do have to mention that my first experience playing Two Rooms and a Boom was sort of a bust and highlights a negative for this game. It’s really not about the game itself but more to do with the players. You really need the “right” players who want to play this game. If you get that marginal person that you have to overtly convince or push to play, then you should try another game. Our very first game and round had a player who outwardly didn’t want to play and they basically put their card face up in front of them. It was a rather disappointing experience out of the gates. I will say my second, third, and especially forth plays were (dare I say it) epic because we had willing and wanting players. The game really exceeded my expectations beyond just being simply a party game. As you carefully go around your room trying to find your team members, some will share and some will not. It makes you look over your shoulder while wondering what Character Card other players have or why some did share with others but not you. This to me becomes more of a social game as you build and break alliances during the three rounds trying to get to your team’s goals or your specific Character Card goals (Grey team has individual goals- saying Grey team is a misnomer). I say it’s more social then a party game because if you play the game correctly, you will likely talk with every player at least once and others constantly if they are on your team. Some party games just bring a group together but Two Rooms and a Boom make all players interact and even make it hard for most players to stop talking about the last game to begin a new one. One critical and the most social role to note in Two Rooms and a Boom is the Leader. I think everyone should try to this role at least once so they can at least see what’s like. It might surprise that introvert in your group that being an extrovert for once is not so bad. As the Leader, you’re significantly in the thick of things, not only with your own room but with the other room’s Leader. You need to be sure to keep the confidence of your room and carefully select hostages not only to consolidate your team’s influence but keeping in mind the overall team goals (plus your Character Card goals as well). Leader Card is durable and a great reference for Leaders and players alike. The rounds will go quick and the Leader has to make some quick choices all the while trying to listen to his team and people in the room as not to be usurped. As players you need to be sure you know the Leader’s Character Card. If not, then you might be surprised at the last round as they have used their influence to find the President and Bomber and win their teams or individual goal. The other thing to note is that Two Rooms and a Boom has purposeful well-designed parings of Character Cards that make each game entertaining and significantly increase the replay value. The Player Guide clearly outlines which Character Cards should pair with each other such as the engineer and the doctor. When you add the Engineer they need to find the Bomber to activate the Bomb and the Doctor has to find the President and administer his medicine. If these characters do not find either by the end of the game then the Bomb will not go off (no matter who’s in the room) and the President will not survive. This leads me to one point in the Two Rooms and a Boom rules that I do not agree with. The rules say that you don’t need a moderator and I highly disagree with regard to first time players. I think someone (really who is teaching or owns the game) should not only set up the game but also explain each Character Card. This person should be completely impartial person and who’s there to help answer questions. Now, once these new players have a game or two under their belts, then have the moderator jump in and try to help root out those Red or Blue team members. There’s another negative worth mentioning and it’s sort of a correctable one for Two Rooms and a Boom. All players are left to the luck of the draw and some might get dealt the same Character Card in multiple games. This can either be a good thing or a bad one depending if you like the character you’re stuck with yet again. This is an aspect that you deal with any card game but since player interaction is vital and if someone doesn’t want to repeat using a Character then this should be corrected because this could affect their attitude and by extension game play. The number of base & advanced Character Cards totals 110 making the replay value off the charts. It’s obvious to see and I really have to applaud the overall creation, intention, and effort of the designers. Their work makes Two Rooms and a Boom a must have and play for me. It socially mixes player interaction and stands out from other “party” games because you have the potential to talk with every player in the game unlike in other games. The game will challenge you and your patience as players don’t do what you want (I hate it when people do that) or you find out that they have betrayed you. It’s another intended social aspect as you try to convince players to do your biding but only to find out that they have played you. I’ve described this game to others as a social poker game because you play off of people’s reactions and if you know them well enough, then their facial tells. Any gamer I know wants to be challenged and Two Rooms and a Boom will gladly oblige. Two Room and a Boom is as fun as it sounds and absolutely worth getting. This one will stay in my collection for a long while. 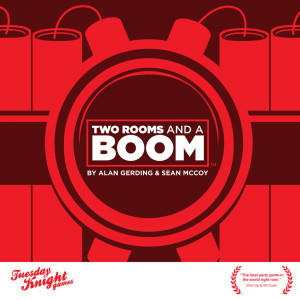 If you are interested in getting a copy of Two Rooms and a Boom, you can pick it up for about $25. 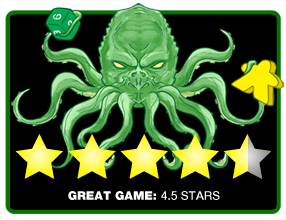 Final Score: 4.5 Stars – A well-built social party game with huge replay value. A must have for any gamer that has access to larger groups or play at parties.